Digital Projection Inc. has introduced the E-vision Laser 5000, a new laser-based entry level product in their line featuring a single-chip 1920x1200 DLP light engine rated at 5000 lumens. This model has Full HD 3D, three HDMI ports (one MHL enabled), a manual 1.65x zoom lens with V/H lens shift, and HDBaseT compatibility. 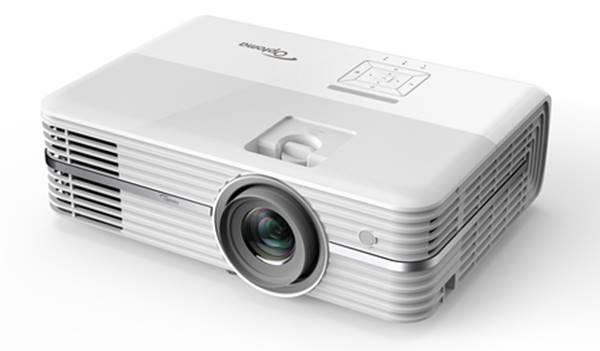 This is the least expensive projector in DPI's line and will begin shipping next month for a retail of $5,000. Epson is showing their new Home Cinema LS100, a laser-based, 4000 lumen ultra short throw projector for home theater and ambient light home entertainment rooms. Priced at $2,995, we posted a write up on this earlier this week, so you can see all the details here. JVC has released six new home theater projectors featuring eshift 5 the fifth generation of their famous 4K eshift technology that is sharper and cleaner than ever. We've loaded full specs into the Projector Database on these six new models: DLA-RS440K and DLA-X590RBK, both priced at $3,999; the DLA-RS540 and DLA-X790RBK, both priced at $5,999; the DLA-RS640K and DLA-X990RBK, both at $7,999. Optoma is showing the previously announced UHZ65, a laser based version of their UHD60 and UHD65 4K projectors using the 4K UHD DLP chip. The retail price is quoted at $4,999 with a MAP of $4,499 and it is scheduled to start shipping very shortly. Sony Electronics has introduced a complete update of their native 4K projectors including the VW285ES ($4,995), the VW385ES ($7,995), and the all new laser based VW885ES ($24,999). See details on new Sony projectors here. Vivitek had previously announced the HK2299 4K home theater projector, but is showing it at CEDIA and intends to commence shipments in the next couple of weeks. This projector features TI's 4K UHD chip. It is rated at 2000 lumens, sports a 1.5x zoom lens with V/H lens shift, and is priced at $2,499. Vivitek also has unveiled an ultra short throw projector in Full HD 1920x1080 resolution, the DH768Z-UST. Rated at 3200 lumens, the lens will allow an image up to 150" diagonal with an extremely short throw ratio of 0.23. Contrast is rated at 12,000:1. This will begin shipping within the next few weeks also, and is available only through CEDIA dealers. Price is not officially published.